QV Children’s Centre is a purpose-built childcare centre conveniently located the heart of the Melbourne's CBD. We deliver high quality and inclusive early education and care for children from birth to five years. Our team of nurturing and experienced teachers will partner with you to develop a play-based learning program that helps your child realise their potential. Even more importantly, our educators will ensure your child is safe, secure and happy while in QV Children’s Centre. Easy access to trains, trams, and buses - making life easier for busy families. Parents and teachers can share and receive live updates about children’s learning from anywhere via the Storypark ePortfolio. iPads are used for a variety of interactive learning experiences. Children can connect with their community and learn in engaging settings outside the centre via our regular excursions. QV Children's Centre vacancies change frequently. Register your interest in our childcare centre here. "We love QV Childcare because the educators show a genuine interest in and love for our children. The centre provides activities that not only engage the children but also encourages them to explore their environment and pursue their varied interests." "Both of our children have been extremely happy at the QV ECMS centre. The staff are very caring and have focused on each of our child's needs, from an early education perspective and a social and emotional support perspective. It has been a pleasure to be part of the ECMS early learning community." Play is the best way for children to learn. That's why at QV Children’s Centre, your child's early education program will incorporate a variety of open-ended and structured play-based learning experiences. Activities will be guided by your child's interests and capabilities, ensuring your child gets the most out of their childcare experience. ​​These play-based activities will help your child develop important social, emotional, physical, language and cognitive skills. This year our kindergarten children will learn French as part of the Government's Early Learning Languages Australia program. QV Children's Centre's architecturally designed spaces reflect the urban landscape of our surroundings. Our flexible indoor play spaces enable educators to set up a variety of play experiences that foster children’s imagination and curiosity. Your child’s early learning program will be delivered by QV Children’s Centre's experienced, passionate and nurturing teachers. Our educators' number one priority is ensuring each child receives the best possible childcare experience. Educators will work in partnership with you – your child’s most important teacher – to develop a childcare program that reflects and builds on your child’s interests, curiosities and skills. Educators will also recognise and celebrate your child's unique background and culture, incorporating this into their program. Educators will share live updates about your child’s development via Storypark - a secure, login-based ePortfolio. Documentation may include photographs, videos, learning stories, and samples of your child’s work. Storypark will also allow you to contribute to and comment on what your child is doing while in care. You can share your family activities and your child’s updates with teachers via Storypark too. 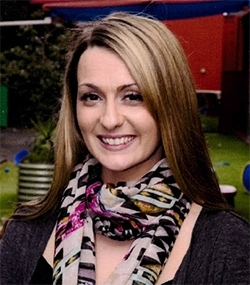 Hi, my name is Clare, and I'm the Centre Director of QV Children’s Centre. I have worked in the early childhood industry for 14 years. I have been fortunate to work at QV Children’s Centre since its opening in 2006. My philosophy is that learning is a triangle; child, parent and teacher. It's our role to teach and support the children and families as well as each other as educators. I am passionate about the early learning and wellbeing of our centre’s children, educators and community, and help to build, support and develop the relationships through positive and effective communication. Working with our 2IC and Educational Leader, I harness our team's abilities to provide high-quality care and education. I also ensure the early learning journey for each child is authentic, rich with knowledge and full of memorable relationships with educators and friends.